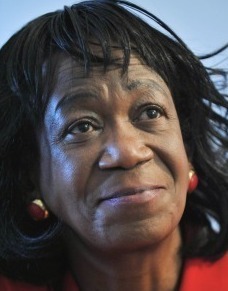 PRESIDENT OBAMA’S aunt — Zeituni Onyango — lives in a 68-unit public housing complex for the elderly and disabled within walking distance of Boston Harbor beaches, a medical center, and lots of stores in South Boston. Broadly speaking, though, she lives in the gap between the state’s public housing policy and common sense. In a WBZ-TV interview last week, Onyango, 58, came across as an ungrateful free-loader. Until May, when she was granted asylum by a judge, the native of Kenya had been living in Boston illegally for about six years courtesy of Massachusetts taxpayers. Yet Onyango managed to say with a straight face that “I did not take any advantage of the system. The system took advantage of me.’’ As for living expenses, Onyango said her sustenance “comes from heaven.’’ And a monthly disability check. The common, fall-back position on illegal immigration is that nothing can be done until Congress hashes out a comprehensive immigration reform law. But state lawmakers can put their mark on the immigration debate, and without looking like a bunch of yahoos. The public is squarely behind such efforts. A Suffolk University survey this spring found 7-to-1 support among Massachusetts voters for requiring proof of legal residency for state subsidies, such as housing. There are two types of public housing in the state — about 50,000 state-subsidized units and 34,000 federally-subsidized units. You can’t tell the difference by looking at them. But illegal immigrants know the difference. That’s because local housing authorities, which manage the developments, require proof of citizenship or legal immigration status for all household members at the federally-subsidized projects. But at the state-subsidized developments — such as Onyango’s abode — it’s just step right up, no questions asked about citizenship status. So Onyango, and many like her, get to kick back in public housing despite deportation orders hanging over their heads. And no one is the wiser until an undocumented immigrant’s nephew runs for president. Illegal immigrants can really milk the system on rent day. Public housing tenants are required to pay about one third of their incomes for rent. But housing officials have no way to verify the incomes of illegal immigrants who work under the table. That allows some illegals to report no income and live rent-free. How many do it? No one knows because housing officials can’t inquire about immigration status in the first place. Republican state legislators have been trying unsuccessfully for years to pass a bill that would require public housing applicants to show citizenship or immigration status at state-subsidized projects, just like they do at federal projects. There’s nothing insidious about it, but it gets lumped in by opponents as an anti-immigrant effort. Last session, Senator Robert Hedlund of Weymouth sponsored a sensible bill with bipartisan support that would give US citizens and legal immigrants preference for public housing. But even that got watered down to nothing in the House. Housing authorities should operate under one, consistent system when determining eligibility for public housing. And the federal system is the right model. It rejects entire households of illegal immigrants. But it recognizes mixed families consisting of undocumented parents and children born in the United States. In such cases, housing authorities prorate the rent so that only the children, who are US citizens, receive the rent subsidy. That’s how it works with food stamps, too. And it’s about as fair as one can be under the circumstances. Not that fairness is keeping Onyango awake at night. She seemed surprised by the TV reporter’s questions about staying in public housing while living illegally in the United States. “They gave it to me,’’ she responded. “Ask your system. I didn’t create the system.’’ Fair enough. The question has been posed. How much longer does Massachusetts want to be played for a fool?